Those opposing his rule will probably end up in jail with tens of thousands of others arrested since the failed military coup of July 2016, Jamie Dettmer said in an analysis for Voice of America. 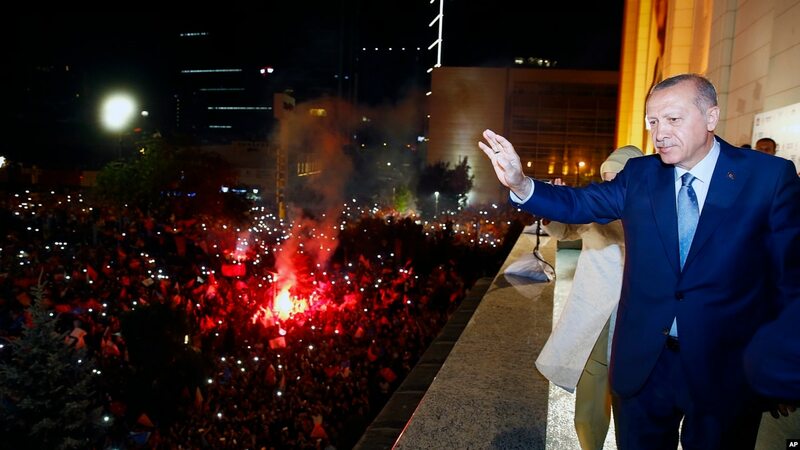 In a victory speech on Sunday, marking an election win that will give Erdoğan an unprecedented ability to execute his agenda, Erdoğan vowed to “fight decisively” against Turkey’s enemies at home and abroad. He also signaled an intensification of the conflict with Kurdish militants in southeast Turkey, Dettmer said. “With direct control over the security forces, both police and military, Erdoğan can easily squelch any potential unrest in the coming days,” Bozkurt said. Bozkurt, president of the Stockholm Centre for Freedom, is accused by Turkey of belonging to the Fethullah Gulen movement, which the government blames for masterminding a coup attempt that killed hundreds of people and damaged the parliament building with a missile from an F-16. Gulen denies the charges. Some of Erdoğan’s dejected opponents will probably throw in the towel and accept government patronage, though that may depend on whether Turkey survives an economic storm that has already weakened the lira by about 20 percent against the dollar this year, Dettmer said. Despite opposition to Erdoğan’s policies, which also include cosying up to Russia, the West faces a “conundrum” over Turkey, because of the impact of the coup attempt and instability across its borders, according to Amanda Sloat of the Brookings Institution.